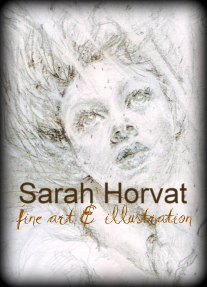 Sarah Horvat is a published freelance illustrator and award-winning artist based in Milwaukee, Wisconsin. She embraces a Renaissance-woman approach reflected among her diverse interests and deeply rooted passions. Her portfolio possesses a wide range of media filled with symbolism and visual textures from realistic to abstract, literal to allegorical, and figurative to organic. Art varies in size, media and presentation from works on paper and canvas to sculpture, installation and experimental. at galleries, museums, colleges, and businesses. She has participated in virtual exhibitions, Twitter.com-based and gallery-hosted art exchanges, ArtWalkTV, as well as traveling exhibitions and art community projects including Art House Gallery and the Brooklyn Art Library, New York. Sarah was awarded the WELS Art Guild Golden Palette Award (1993), selected for the prestigious Lakefront Festival of Art college exhibit and chosen as the Fine Arts Representative groundbreaker for the Wisconsin Lutheran College Center for the Arts (1995). Her illustrations were published and art exhibited in various galleries, while also working at two historic Milwaukee mansion museums with contemporary galleries. She more seriously focused on her art when her entire "Eve Series" was selected for the New York exhibition, Paradise Lost, that celebrated poet John Milton's 400th birthday at the Williamsburg Art & Historical Center, Brooklyn (2008). The Paradise Lost exhibition continues to receive worldwide recognition. National Association of Women Artists, Inc., (N.A.W.A. ), and Williamsburg Art & Historical Center Salon, New York. She was a featured premiere showcase in Milwaukee Art Beat, Milwaukee's Unique Arts Showcase Series (2009) and later as the MAB Board's Community and Artist Liaison. Sarah has won a variety of awards and her art is in national and international private collections, as well as gallery collections including the public permanent Wickenheiser Collection of John Milton at the University of South Carolina. She teaches specialized multi-curriculum and foundations grade school art classes and has been active in various arts community and collaborative think tank groups. Currently she is writing and illustrating a children's picture book.